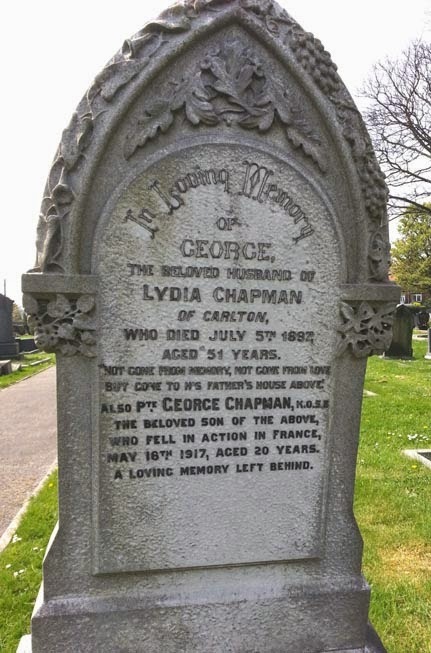 In Loving Memory / of / George / The beloved husband of / Lydia Chapman / of Carlton / who died July 5th 1897 / aged 51 years / "Not gone from memory, Not gone from love / But gone to his Father's house above / Also Pte George Chapman, K.O.S.B. / Who fell in Action in France / May 16th 1917, aged 20 years / A loving memory left behind. George is also remembered on the Carlton War Memorial, St Johns Church, Church Street, Carlton and on the Arras Memorial in France.